The historic Akron Civic Theatre, built in 1929 on Main Street, Akron, Ohio, was exploring ways to improve the aesthetics of run-down store fronts dating back to the early 1900s within the heart of the city. 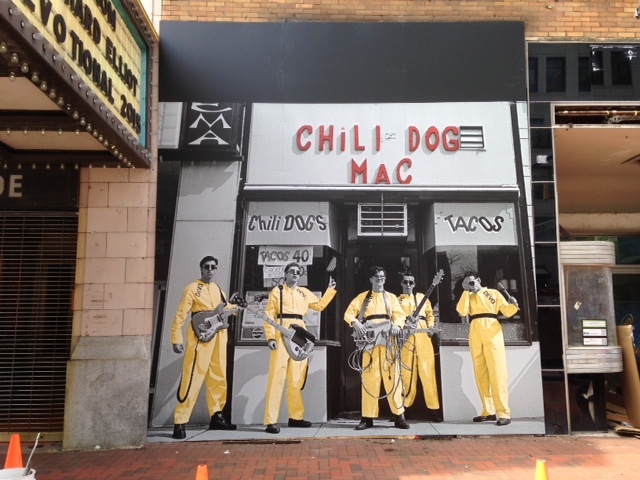 After uncovering the iconic photo of Devo, an American rock band formed in 1972 with members from Kent and Akron, Ohio, the theatre commissioned the Akron Summit County Convention and Visitors Bureau to fund a wall mural. Long-time partner Central Graphics selected Mactac’s tried-and-true REBEL Multi-Print Media and PERMACOLOR ColorGard LUV overlaminate for the job as the economical solution that they knew would withstand the extreme weather conditions of each season. They also needed a tried-and-true media guaranteed for a variety of application materials from degraded plywood and glass to metal and marble. Available in high-performance, intermediate and promotional vinyl films with high-tack, permanent and removable adhesives, REBEL Multi-Print Media is designed to be a go-to solution for any graphics application. REBEL can be digitally produced or screen-printed for labels, decals, markings, point-of-purchase displays and signs for indoor and outdoor use. For ultimate results, PERMACOLOR ColorGard LUV overlaminate provides superior protection and color enhancement with fast, efficient results, quick wet-out and non-silvering properties and is available in gloss, matte and lustre.